I mentioned a few posts back that I had ordered my essential oils starter kit and have had it for about a month now. 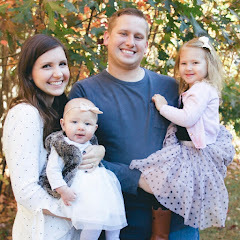 I will admit that both Tyler and I were a little bit skeptical about oils, but we were pretty desperate to find something to help Ellie sleep better at night and willing to try just about anything. 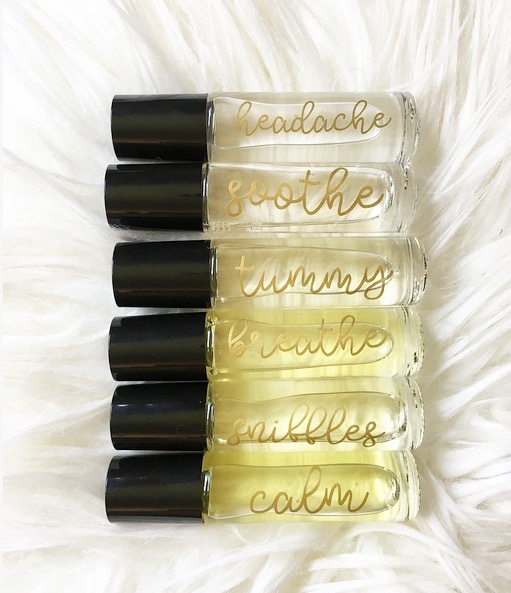 Turns out, we are using and loving them more than we had anticipated so I wanted to share a few of the ways we've incorporated oils into our everyday lives in such a short period of time! 1.) To wake up. 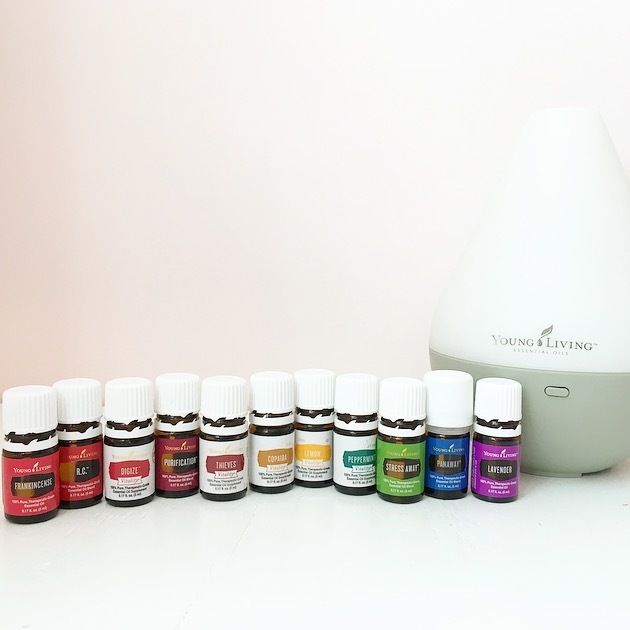 // Putting oils in the diffuser first thing in the morning is one of my favorite things to do, especially on weekdays when I'm home just with the girls. My favorite pick-me-up blend is Peppermint + Lemon! 2.) To keep sick germs away. // Thieves is the mother of all immune system boosters! I've added it to my coffee (so good on cooler mornings! ), diffused it with Lemon and made a roller with coconut oil to apply to our feet. When Tyler came home from work not feeling so well one night, I made added a drop to a hot cup of water for him to drink before bed and it totally did the trick! If you have kids who are going back to school, attend daycare or even ever come in contact with the outside world, I can't recommend this enough. I know we're going to benefit so much from Thieves all cold season long! 4.) To cook with. // Yes, you can cook with oils too!! The Vitality oils (white labels) and their corresponding "regular" bottles are safe to ingest (as well as diffuse and apply topically). This is perfect for someone like me who tends to forget to buy fresh ingredients or forgets about them in the fridge for a little too long. Lemon + Peppermint come with the Premium Starter Kit (and taste great in iced water too! ), but there are tons of other oils available to use in the kitchen. I have Orange + Grapefruit coming my way soon, and hope to add a few additional ones (like Cloves + Cinnamon) for the fall months! 5.). To do laundry. // There's a big "ditch and switch" mentality when it comes to incorporating oils into your everyday lives. What I mean by that is using oils (or other natural products) in place of many store bought products that might include some not-so-pretty ingredients. As Tyler tells me, I am a definite realist, so I will say that we're not about to switch out all of the products that we use, but we hope to take some baby steps with this process. One of the easiest things I could think to do was switch out dryer sheets for wool balls. I already had the wool balls from before Ellie was born and I was afraid to wash any of her clothes with dryer sheets in case they irritated her skin. I just dug them back out this weekend (from Ellie's toy bin, she had been borrowing them), added a few drops of oils and popped them into the dryer! So easy and our laundry smells great. 6.) To tame our manes. // I am working on perfecting my hair detangler recipe for Ellie's crazy snarls, but have been using our Beach Waves spray on both of us already! It's super easy to make and smells great too. 7.) To replace traditional beauty products. // I bought jojoba oil to use as a carrier oil, but have been loving using it as an eye makeup remover! I've also added a bit of Frankincense to it and used it as a moisturizer. Copaiba works well on blemishes too. 8.) To make all the boo-boos better. // I've made rollers for all the things and LOVE them! An owie roller for the girl who's always getting bumps + bruises, sniffles for allergy relief, soothe for sore muscles + tummy for those days of unsettled bellies - just to name a few! Rollers are my favorite way to use oils so far, we are seriously always reaching for them!! 9.) To make our house smell good + clean. // Our house is usually not the cleanest (or atleast not the most organized), but a few drops in the diffuser make it feel so much cleaner even when it's not. ;) A drop of Purification on a paper towel helps keep the smelly diapers or food from taking over the trash can too! 10.) To get a better night's sleep. // Last but certainly not least!! The reason we invested in our kit and are so glad we did. The more you use oils, the more they will benefit you and we've seen some pretty big improvements in Ellie's sleep patterns already. She still has trouble calming down some nights, but once she's asleep, she does so much better than she was doing before. We roll her feet with Lavender and use a linen spray on her pillows + stuffed puppy every night before bed. Ells loves this new bedtime routine and we do too!